I recently sold this oil landscape, titled “Light on the Saddle”. It measures 50 x 40 cm. The spot depicted is a neck between Devil’s Peak and Table Mountain called “The Saddle”. 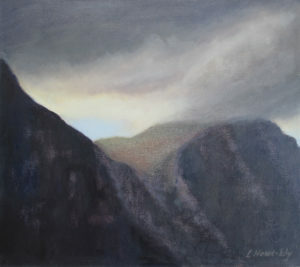 The painting shows the view from the eastern side, from Newlands. I love the drama of changing light on the mountain and was fascinated by the way the sunlight, coming under the cloud from the west, fell only on the Saddle. The top of Devil’s Peak is obscured by cloud. 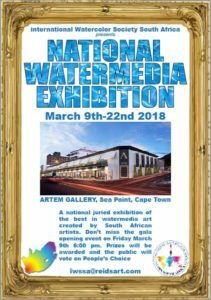 I will be showing three watercolours at the International Watercolor Society South Africa Exhibition at the Artem Gallery in Sea Point. The opening is on Friday the 9th of March at 6pm and the exhibition will run until the 22nd of March.